PORTUGAL, EUROPE'S LEADING TOURIST DESTINATION 2018! 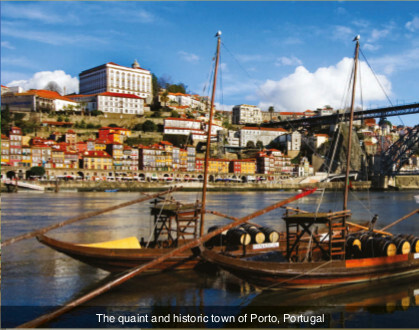 Experience the unique sites and culture of Portugal with a taste of Spain on this combination land and river cruise Main trip. We start our journey by flying into Lisbon and we stay there for two nights in a four-star hotel. We then travel to Fatima and sightsee in Coimbra and then board the brand new, exclusively chartered river vessel the MS Emerald Radiance for our seven-night river cruise along the Douro River. We also venture to Rodrigo, Vega Terron, and Salamanca Spain. We end the Main trip in the home of Port wine, Porto, and fly back to the US. Or there is an optional three-night, four-day post trip to Barcelona for an additional cost estimated to be $1,489 which includes airfare but doesn’t include a Barcelona city tax (approximately $3 per person per day). THIS TRIP HAS SOLD OUT! CONTACT THE TC IF YOU WISH TO GO ONTO A WAIT-LIST. The price currently listed for this trip is based on the information we have from the TSC per their negotiations with the tour operator. It is based on the accommodations described in the trip page.We will make adjustments, if any, once we know our lodging after Oct. 1, and will notify you of any changes. Cancellations: If registrant has trip insurance, pursuant to the terms of the insurance policy. If registrant has no trip insurance, Mayflower will access fees according to its policy. Mayflower will be as lenient as possible imposing any fees. If you are not familiar with the Space City Ski & Adventure Club cancellation policy, please read it HERE. You have until Final Payment Date to pay your balance. Final payment date for this trip is May 13, 2019.